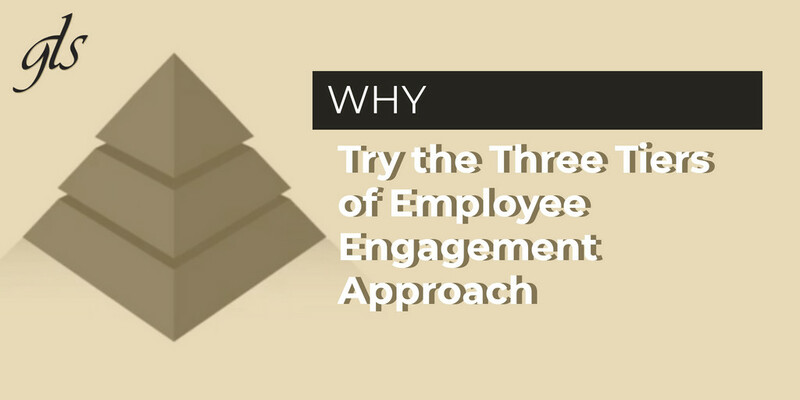 Why Try the Three Tiers of Employee Engagement Approach? Employee Engagement can be an enormous challenge for some employers, which can make or break the company as it really affects their profitability and success. At GLS Group, we have many custom solutions for your company’s engagement issues such as a three-tiered approach to employee recognition. How Do the Three Tiers Work? The Organizational Level is the most personal form of recognition. It is a celebration of each individual person in the company. This level offers typical awards such as new-hire programs, retirement gifts, wellness incentives, and time for life events such as birthdays and marriages. This tier shows the company respects what matters to each person in the business. The Top Down Level focuses more on what each employee is specifically contributing to the company. Likewise, the awards in this tier are manager driven awards that are designed to recognize employees for working in the best interest of the organization. There are many different types of awards for this tier such as sale incentives, certification awards, continuing education programs, or leadership and safety awards. The overall goal of this level is to improve the organization by encouraging employees to improve themselves. The problem with some companies is that management can’t always see every individual’s achievements, as often times they’re not even in the same location. The Peer to Peer Tier allows other employees to recognize their co-workers for their successes. This also amplifies all employee voices who could otherwise feel unheard. Moreover, peer recognition can strengthen the social connections of co-workers and create a positive environment for the individual and the company to grow. It can be difficult to always create new ways to engage your employees with your company. But, we all know how important every individual’s involvement is! At GLS Group we specialize in making your company better by designing an engagement program that works for you! If your company is struggling with employee engagement or looking for new and exciting ways to increase your brand awareness and profitability, contact GLS Group today!